We haven’t seen much of it this winter yet. I am talking both about the ice you would expect in winter and about the one created from extracting heat from a water tank – our heat pump system‘s heat source. The tank of water can be considered a buffer that stores energy harvested by the solar collector; in addition some energy is directly harvested from the surrounding ground. The water tank temperature is 20°C maximum. This is the maximum heat source temperature the heat pump can deal with, so the solar collector is hardly used in summer. Heat provided by ground is sufficient to provide the energy which is extracted from the tank on heating hot water. The specific heat of water is 1,16kWh per m3 – cooling down the 25m3 tank from 20°C to 0°C provides about 580kWh. Currently we need about 70kWh per day for space heating and hot water heating; the maximum in this season was about 100kWh per day so far. 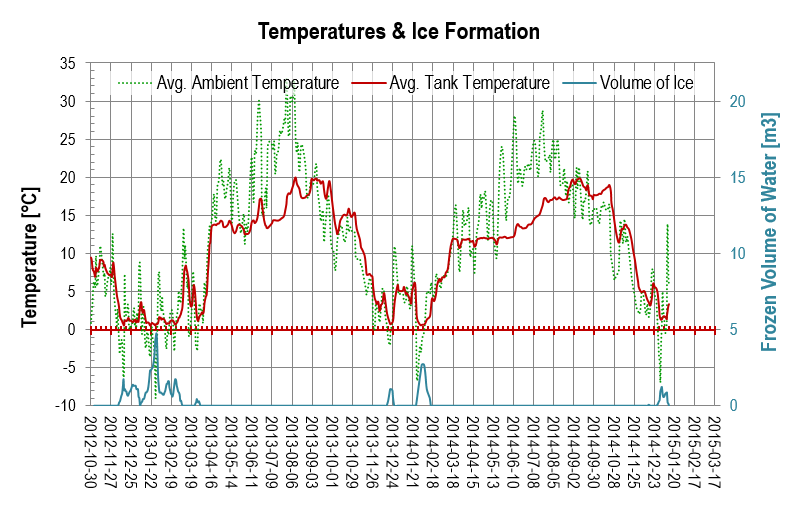 We had not seen ice before December in the past three seasons: Water does not freeze as long as as the energy provided by the solar collector replenishes the energy in the tank quickly enough. The ice formation curves in the first figure show that the blue peaks always follow a cold spell of weather – a negative peak in the (green) ambient temperature. As soon as there is a positive peak the ice is quickly melted again. This year the latest green positive peak was quite pronounced – about 12°C average daily temperature; maximum temperatures were about 20°C in some regions in Austria. But we try harder now to create a gigantic ice cube: On rebuilding the solar collector last summer a new feature has been added for research purposes – the effectively utilized area of the collector can be changed by letting brine only flow through a subset of the tubes. If this is still not sufficient to challenge the system we might turn off the collector permanently in February. 100kWh heating energy per day translates to 75kWh to be extracted by the heat pump (given a performance coefficient of about 4). 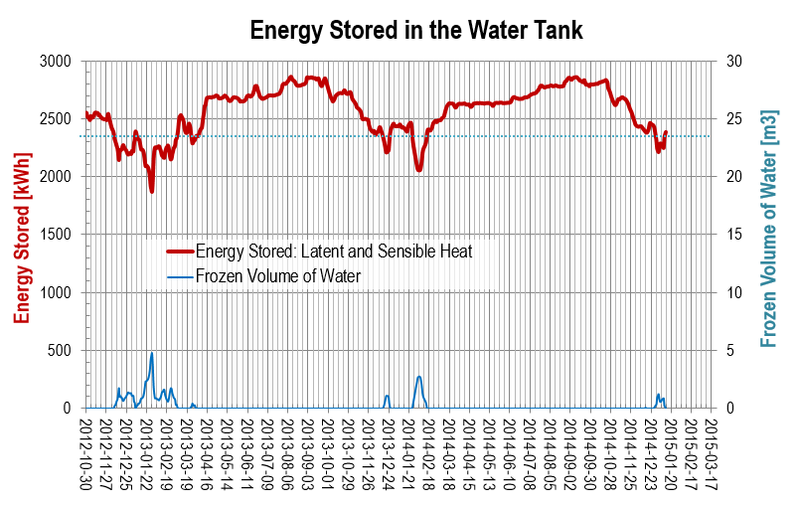 The tank containing about 2.000 kWh would then be exhausted and completely frozen in 27 days. Other plots and key performance data for each month and each season are detailed in our documentation of measurement data – this file contains two full seasons as per the writing of this blog post. In the unlikely case somebody stumbles upon this post when searching for historical weather data for Austria: The English Annals page show the data in a format that is difficult to work with (you need an outdated browser), but CSV files can be downloaded from the German page with historical data. Pick daily data (Tagesauswertung) for the greatest level of detail. This entry was posted in Heat Pump, punktwissen, Science and Technology and tagged Energy, Engineering, Heat Pump, Heating, Ice, Ice Storage, Latent Heat, Solar Collector, Technology, Water Tank by elkement. Bookmark the permalink. Enjoying slowly catching up on your blog years late. How do you measure/estimate the ice volume? Is it just a function of the amount of energy taken out of the store once it’s down to 0 °C or is there something cleverer? Increase in surface level? Does the ice form round the pipes or does it float on the surface? Hi Ed! Yes, it’s the increase in surface level, measured via the pressure increasing linearly with depth. This was actually the last sensor we have just automated – for a long time we measured the level manually by reading off a ruler. The ice forms at the pipes – where the temperature is lowest (If it would float, the increase in water level could not be used for measuring ice volume). Thanks for your quick reply. Took me a while to get round to thinking it through properly. Of course, water expands about 9% on freezing – I knew that from icebergs but hadn’t really internalized how much that is in practice. So for every 1% of your tank which freezes the water pressure at the bottom should go up by 0.9% which should be reasonably easily measurable with the right sensors. This is a good question! We don’t worry as the heat conductivity of ice is about four times greater than that of water, and its thermal diffusivity is 10 times greater. One thing I did not discuss yet is the missing convection in the solid – I focussed on heat conduction in the literal sense. I suppose that missing convection may be a, or maybe ‘the’ concern with using other phase-change materials, as a quick check of published research tells me for nearly any common PCM (waxes etc…) the thermal conductivity of the solid is (a bit) bigger than that of the liquid. I didn’t know about the higher conductivity of ice (thinking of igloos my assumption was the opposite but they’re probably made more of snow with air pockets) but reading your first comment my thought was “…but but convection” so it’s nice to see you’ve got there first. I’ll slowly catch up with my reading here. The heat conductivity of ice is similar to that of concrete, about 2 W/mK which might explain the igloos. Not spectacularly high in absolute numbers but not a good insulator either. Water has about ~0,5 W/mK. Well, I’m sorry you aren’t getting the winter you’re ready for, although I’m glad this has been a rather warmer winter around here than we suffered through last time. We’ve only had one week that dropped to about zero Fahrenheit, and that we haven’t gone eight weeks without breaking above freezing this year. I am totally interested in comparing the operations of different heating systems in different climates. Would you perhaps share your latitude or the US state your are referring to? Austria is actually north to nearly all US states (but Alaska) but it seems the middle European climate is much milder. Oh, yes, certainly. I’m in mid-Michigan — Lansing, about a third of the way up the lower peninsula, the one that looks like a mitten — so that’s about the latitude of Andorra, Cannes, or Istanbul. The winter climate is intriguing, though, since the sun disappears behind overcast clouds sometime around October, and never reappears. That’s an exaggeration, but it is common for folks to have vitamin D deficiencies and need to take supplements for it. And we get a good bit of snow, fed by Lake Michigan to the west, although it happens we’re a little south to get the full force of (normal) lake-effect snows. Funny–just this morning I was explaining your system to a friend who visited me at work. The context of that talk was that my province needs to better use the energy reserves it has rather than trying to create so much more at huge cost. Your system makes so much sense in my context–at least I think it does. Hmmm–just a thought–it would be nice to have you and your husband over here at some point and give a a talk to the engineering faculty about what you do. I bet there would be interest in the system moving into the future. The weather here would also put it to the test. Some days here the daily usage in my small home approaches 200 kWh (although a little over 100 is more typical) and the outside temps tend to always be below zero. Thanks a lot Maurice for this generous comment! I bet your colleagues would also ask first if the system would work in your province – and Dave and Michelle have already pointed out two potential issues: 1) You need a somewhat reliable power infrastructure (Heat pump systems are built to sustain several hours of outage but several days would be an issue) and 2) … the climate. But if I recall correctly you once mentioned in another comment that you heat your home electrically and that air heat pumps are used in your region. So both power infrastructure and climate should not be showstoppers (?) Our system relies on heat transfer from the air via convection, and air heat pumps do perform worse as there is no ‘fallback’ from the very cold air to harvesting the latent heat in the tank (They fall back to classical 1:1 electrical heating). Without doing a detailed simulation I dare say that if an air heat pump is an option, our system is too, and should perform better given the same climate. You also mentioned that electrical energy is rather cheap – so even if the coefficient of performance is lower (e.g. 3) it might still be economical. It is finally a matter of the costs of the initial investment versus running costs – difficult to make a prediction in times like this (plummeting oil prices). You can have some of our winter; we are warm enough right now (-23C feels nice!) but were at -45C and colder last week. We’re thinking about moving to Canada’s east coast in a few years; a place that doesn’t get so frigid. We had a residential-sized private sewage lagoon on our farm. The first winter there the lagoon wasn’t to capacity (too small) to not freeze solid to the bottom. It was awful. Sewage water kept coming up into the basement; we had to monitor it before flushing toilets or running showers. At least once week my husband would start up the chain saw to cut up ice blocks. Then, we’d heave this 20 to 30 pound blocks out of the hole. Sometimes my throws didn’t always clear the chain link perimeter fence (5′ high) with the additional 5 or 6 feet in the hole. The fence reacted like a kind of sling shot that shot back. (That was a crappy winter.) Normally I wouldn’t wish giant ice cubes on anyone, given the experience, but good luck to you. Wow, that sounds …. (thinking about a positive adjective…) ‘challenging’! I wish I’d know how common sewage lagoons are in Austria to compare this experience of yours to anything. But I guess they don’t ever freeze here. Minimum temperatures here (in the lowlands and cities of course, not in the mountains) are rarely ever below -20°C. I have recently checked weather data for the past 20 years – the lowest ever average daily temperature I have found was about -14°C. This is the worst case average temperatures heating systems are designed for. As for wishing me an ice cube (Thanks :-)): The funny thing is that such ‘ice storage heat sources’ are sometimes marketed as ‘heating with ice’ though the exact phrase should be more like: ‘creating ice as a side-effect of heating’. But I have once in a while encountered discussion threads where people actually worried about ‘not having enough ice for heating’ in the literal sense. I’ve always meant to ask about the circulating pumps required to drive this system and … what would happen if you lost power in winter? In out part of rural Pennsylvania, electrical outages which may last a day or so are fairly common (which is why we have a 10kW generator on standby). What if your system were exposed to an absolute power loss for a day or so at subzero (F) temperatures? We have a wood powered stove but we use it mainly to ‘get rid of wood’ as the remainders of the old roof truss. In Austria the average power outage per client of a utility is about 15 minutes per year – very, very rare. I think I have never encountered an outage lasting longer than one hour in my whole life. If it would be more common, people had backup generators. I can see the wind turbines from my office window, and the grid is in good shape. I guess the population density is much higher here, even in rural areas, so the grid is easier to maintain. Actually many people in Austria have log burners and tiled stoves – but it is more considered a part of classy living room furniture or an option to heat ‘a bit’ if they do not want to turn on the main heating system. Also all other central heating systems used in homes here (gas, oil…) require electrical power – e.g. the most popular alternative energy powered heating systems are wood pellets burners that need power for driving the feeder. If there is an outage heat pumps actually are at advantage as they are typically built with a buffer storage built in – a hot water tank or the concrete of the floor heating system. There are lower power tariffs for heat pumps which allows the grid operator to turn off power suddenly for up to two hours – this is longer than any realistic power outage and heat pump systems need to be designed for that. 15 minutes per customer per year! Wow! Perhaps I should move to Austria! I would estimate that we lose power … 6-8 times per year … and that varies from year-to-year. The outages range in duration from less than an hour to a couple of days! Average is 6-12 hours per outage. You’re lucky to have such a dependable energy source. I remember it as: An outage of half an hour every 3-4 years. I think our internet line is down more often than power. Experts in risk management are actually saying we are spoiled by the reliable grid / power supply as people are hardly prepared for a longer outage (an effect called vulnerability paradox). A gloomy novel about the consequences of a blackout following a hack made headlines. Another thing coming to my mind now: I have recently share articles about the damage squirrels do to the power infrastructure in the US. This is an issue unheard of here. It might be related to the population of squirrels but I think the main reason is that the power lines at the lower voltages (so anything except the transmission lines operation at the highest voltages – 220kV or 380kV) is underground in middle Europe. You rarely encounter those smaller wooden poles here that I see in US movies. Yes … we’ve had squirrel problems out here where we live! Totally frustrating. There are always very small shorts in the lines … our internet gets a bit shaky whenever it rains! My limited experience in Switzerland showed me that most major infrastructure is indeed underground … smart … very smart indeed. But large-scale heat pump systems utilizing water / ice tanks are indeed built with air conditioning via the ice in mind. Our system uses passive cooling in summer – using the cold water in the tank. It was had not to expand but I restrained myself. Many thanks for the award! This winter does still have a chance to live up to my expectations 🙂 I hope the best for February! But honestly I would rather prefer turning off the collector instead of facing really cold weather. I think I would not miss snow or cold at all. I actually do like cold weather. I like fighting off the chill. Hell, I even like camping in the winter, when the temperature drops to -20°C and below during the night. I did that for two weeks in 2009/10. I was never healthier than in the following summer.